Lam came home from preschool with a toothbrush, dental floss, and other mementos from her visit with the Smile Squad. Best of all, she was no longer scared of having someone examine her teeth. Smile Squad had visited McKee Early Learning Center to give students a dental screening. 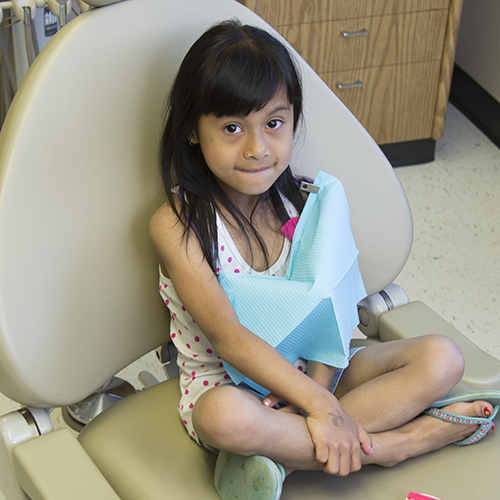 At the time, Lam’s family didn’t have dental insurance, and they were saving up for Lam to have dental work. Smile Squad connected Lam’s family with its Dental Connections clinic, where she received a teeth cleaning, exam, and x-rays. A few weeks later, the clinic treated Lam’s cavities and continues to provide routine dental care. Research shows that children with untreated dental problems can have trouble focusing at school, increased absenteeism, and lower academic achievement. Smile Squad provides screenings to about 6,000 students at early care centers and elementary schools and 800 exams at a mobile clinic each year. Women United supports Smile Squad and other programs, including 17 child care centers and 200 in-home providers. Members believes that all children deserve quality early care and learning opportunities from birth. Each year, the group invests more than $1.6 million in research-based strategies and programs that create a lasting impact on the next generation. Women United is a diverse, vibrant group bound together by the mission to improve the future of our youngest central Iowans.